Our outdoor lighting turned out awesome. All my neighbors have stopped by to admire my lights and ask for the name of my installer. They also did an outstanding job adding to the landscaping of my home. I am very pleased with the light work and the landscaping will recommend them again and again! The guys are polite, trustworthly, take pride in their work and are here every week like clockwork. The quality is outstanding. The guys are always willing to work with me when I have a schedule issue. They are polite and always do a professional and quality job. My new irrigation installation exceeded my expectations. Chris was professional, knowledgeable and walked us through the whole process. When the job was done, the system ran great and my yard was returned to it’s original condition as if no one had ever been here. We hired Trophy Landscaping around 1993 to service our yard. The guys do a great job and are always dependable. We moved in 2004 down the road a few miles away and asked them to continue to service our new home. The property was in need of alot of work…landscaping, irrigation, tree trimming, etc..and they were able to work with our budget and accomplish everything we needed. My husband and I are more than pleased with the outcome and we feel confident that we made a wise investment. We have been a long time customer since Trophy Landscaping began in 1989 and have not found a reason to stop using this service. 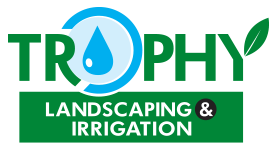 Their customer service is excellent and they are always available to answer questions, fulfill special request and do any sort of extra work like landscaping and irrigation. They are trustworthy, dependable and do a super job. Trophy Landscaping has been servicing our yard since the eary 1990’s. I consider them to be very knowledgable and, because the yard was always done to perfection, I asked Cary to transform my back yard. I told when he finished the job that he had transformed my back yard from a jungle to a paradise….a place my wife and I thoroughly enjoy. This is one dependable lawn service. I am a retired Senior, have been with them for years and really enjoy the ease of their monthly billing cycle. I never have to worry about the lawn getting done, this works great for me. I was very satisfied with my new irrigation system. I had (9) zones installed and the whole process ran smoothly from start to finish. Thanks Chris, great job! 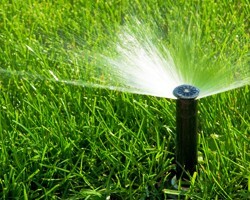 I have been a lawn maintenance customer for about 3 years now and love this service. They are very dependable, run a consistant schedule and do great work. In February 2010, I had them install an irrigation system and voiced my concerns about making sure that the system would allow for the landscaping that I had planned in 2011. The irrigation system was installed by a company that listened to what I wanted and accomplised the task down to the last detail. I hired them in 2011 to landscape my front yard and I was so please with the results, that I, was motivated to go ahead and landscape the back yard. I have had so many neighbors stop and tell me they love what I have done to my home and I am pleased beyond words. If you want some one who pays close attention to detail, takes pride in their work and gets the job done right the first time…I highly recommend them.